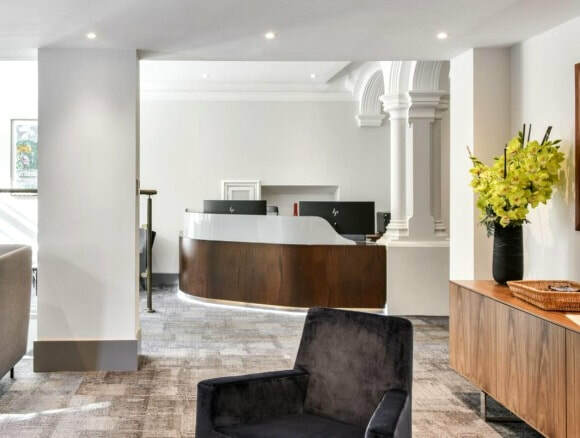 Located in a convenient position for Green Park and Bond Street tube stations, Farm Street serviced offices boasts a pleasant interior with high quality furnishings. The period building is impressive in appearance and retains many of its original features including sash windows and a stair case which have been restored to their former glory. The furnished office space is spread over six floors and has IT infrastructure already in place ideal for a fast set-up. With a private car park on-site for occupants, these offices for rent are also air-conditioned throughout and can be accessed on a 24 hour basis. The business centre also has a number of facilities within such as meeting rooms and lounge areas to relax.